We stayed in San Mateo County Memorial Park, and were guided by renowned naturalist Nate Grieg, visiting biologist and photographer Ursula Esser, recreational director Kelly Murray, and a music/movement instructor. Thursday — McCloud Falls. Hike to waterfalls, swim, fish and aquatic field biology in one of California’s most healthy watersheds. 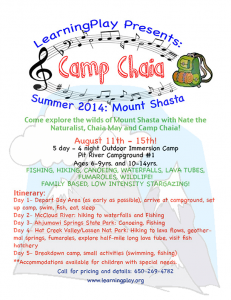 Come explore the wilds of Mount Shasta with Nate the Naturalist, Chaia May and Camp Chaia! Fishing, Hiking, Canoeing, Waterfalls, Lava tubes, Fumaroles, Wildlife! There are so many ways to do this! Learn to speak out, speak publicly or improvise in the moment in a group with specialists from around the Country! 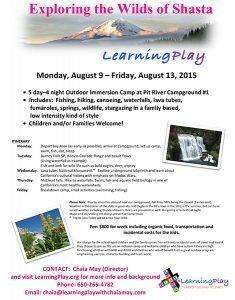 LearningPlay presents the following New and Exciting Programs for School Aged Children featuring our Nature Education Specialist Nate Grieg and Chaia’s wonderful supportive Staff! 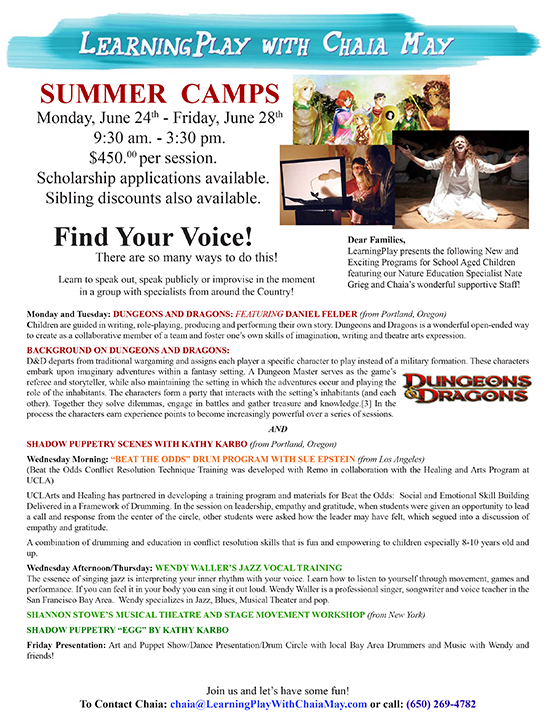 Studios in Palo Alto and Menlo Park, as well as home and school visits around the Bay Area.